Hello friends! Another milestone has been made: I've been accepted into the Canadian Beauty Blogger Network! I'm so thankful for this opportunity and really, my drive to write comes from knowing that you appreciate and take the time to read this little blog. So a big thank you and lots of love to all the readers out there! I collaborated with my long time friend (of 11 years!) Toby with this short list of summer must-do activities. There's only a month of summer left so we must take advantage of the warm, sunny weather and do as much as we can outside! Some of these activities are held on specific days in the summer, some can be done anytime. Take note and enjoy these fun moments with family and friends! Last summer, my friends and I did a 5K run called Colour Me Rad. This run is unique because during the course of the run, people throw coloured cornstarch at you. It was such a fun experience, especially since I did it with my closest friends. It was also a great challenge for me because I’ve never done a 5K run before. I would definitely recommend this as my number one summer activity for those of you who haven’t done this yet. Lighting fireworks and playing with sparklers is another one of my summer favourites. In this picture, it was my first time lighting sparklers so it was really exciting. I also really liked lighting fireworks and then running away as fast as I can. It was such a thrilling experience and I would definitely do this again. Last on my summer activities list is having a barbeque potluck. My friends and I would bring groceries to a friend’s house and we would prepare a meal together. It’s always such a relaxing activity because after eating, we can just chill and talk. Thanks for the picture Bernard! No, don't worry I don't mean the farms where you see cows, pigs, and lambs (it would be smelly but that could be fun too!)... but the fruit and vegetable farms! It's only in the summer when you get to hand pick your own fruits to enjoy as a refreshing snack, and at the same time you get to support the local vendors! Strawberry picking has always been very popular, and I'm sure my friends Bernard and Vivian enjoyed their time at Whittamore's Farm! This farm prides on its excellent fruit and vegetable harvest that can be picked by customers or bought at their store. It's also known as "the farm in the city" so it makes the trip to the farm not too far and very convenient. If you love lavender (like I do)... there's also a farm for that too! This one is newly opened called Terre Bleu, run by a family in Milton ON. You get to walk among rows and rows of this sweet smelling flower while picking some for yourself as well. I'm sure many of you have heard of how lavender has its calming and anti-anxiety effects on people. It is definitely more of a peaceful and relaxing place to visit compared to a busy and lively fruit farm. Not only is this an opportunity to marvel at the never-ending fields of lavender, but the property also includes an apiary where they harvest their very own honey made by honeybees, an equestrian ring with their own horses, and an essential oil distillery. A beautiful place to visit! For all the Torontonians out there, this is definitely a summer event that you don't want to miss! Summerlicious is that time in the summer when you get to eat at some of the best restaurants in the Greater Toronto Area. The restaurants that participate in this event create a menu with a set price consisting of three courses and it's a chance for you to try some amazing food and enjoy some fine dining. Restaurants such as Canoe, STOCK, Auberge du Pommier, Bymark, and Sassafraz participate every year. This GTA-wide restaurant event is also held in the winter (known as Winterlicious) but what I enjoy about the summer event is that you can dress up and have fun with your friends downtown before or after dinner! Picking out a dress to wear and doing my makeup for a fancy meal is always a bonus to a great lunch or dinner in an upscale restaurant. Some of the views from the restaurant are fantastic! (Canoe on the 54th floor in the TD Bank Tower, overlooking the downtown core *swoon*) Dining on the patios is only possible during the summer too! 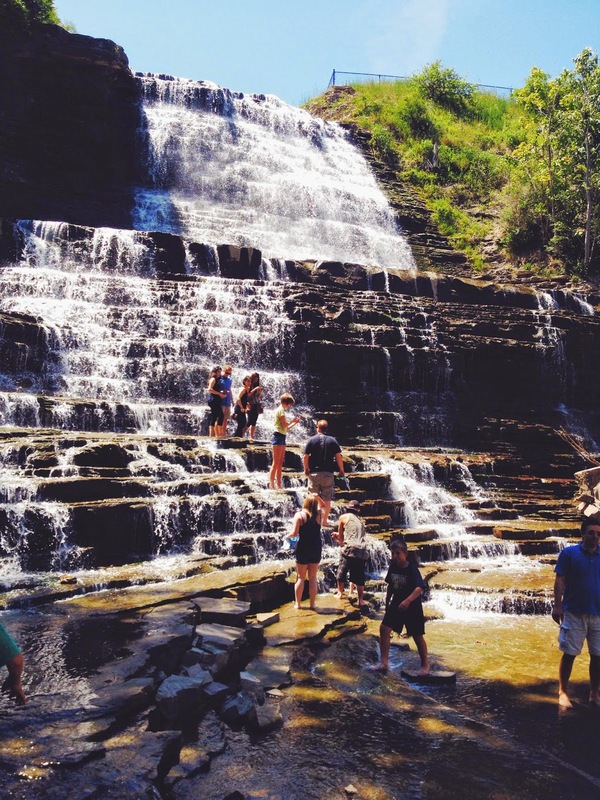 Hamilton is known as the waterfall capital of the world, with over 100 waterfalls for visitors to admire! I'm sad that I didn't take advantage of seeing these waterfalls when I was in university at McMaster. There are also some that allow you to explore and walk around, in front, at the top, or even behind the rushing water of the waterfalls! It's definitely a beautiful sight, like this photo that I took on my visit to Albion Falls. I got to (carefully) climb up the waterfall and it feels so good to have your feet soak in the clear water on a hot summer day. Definitely worth the drive into this city! Some other famous waterfall sites include Webster Falls, The Devil's Punchbowl, Tiffany Falls... and of course many many more.